The watchlist/scanner interface now includes an alert/status column, as well as columns displaying the stop and targets. In this example we have a single watchlist linked to a chart. This is perfect for monitoring a large basket of securities in one bar interval. The number of watchlists you use is entirely up to you. 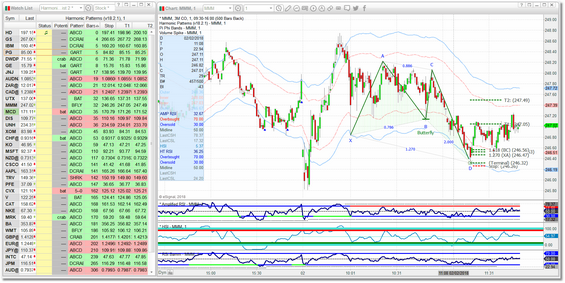 The Harmonic Patterns indicator also works with the eSignal Market Screener Plus. Three watchlists each running in different bar intervals. All of the watchlists are linked by symbol and interval to the chart. Using this layout you can monitor for harmonic patterns in multiple intervals without taking up all of your screen real estate. Note: If you are new to eSignal and want step-by-step instructions on how to get started, please see our New User Instructions page. 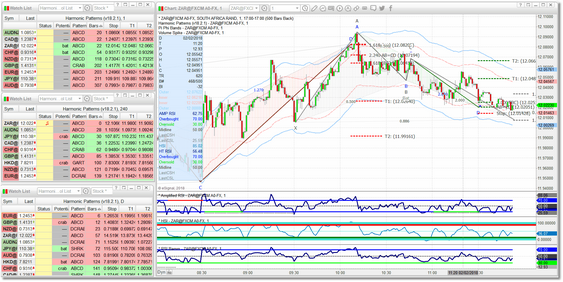 If you are looking for our HPC for NinjaTrader product, please click here. The Harmonic Pattern Collection for eSignal is one of our more popular products and it has undergone a major redesign for 2018. The pattern engine has been completely reworked as has the watchlist/scanner interface. Targets and stops have been added, and the PRZ has been updated to include more relevant zone lines as well as terminal bar identification. As a result the current version is faster, more efficient, and finds many more tradeable patterns than the prior versions were capable of. 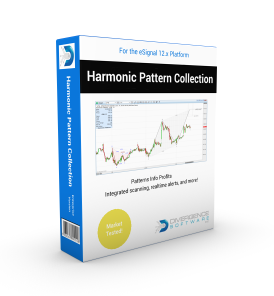 The Harmonic Pattern Collection works with all securities and all bar intervals available in eSignal. Here is the link to the HPC for eSignal Installer Program. Current version is v19.01.31. Follow the instructions in the Installer section of the User Guide to install the software. We do offer a free trial so please take advantage of this free trial BEFORE you purchase a subscription. To request your free trial, just send an email to support@sr-analyst.com with eSignal Trial in the subject field, and include your full name and your eSignal Program Username. It is also one of the few harmonic pattern tools fully endorsed by Scott Carney, the president and founder of HarmonicTrader.com. Scott owns all of the trademarks associated with the harmonic patterns and is the hands-down expert in teaching others how to trade the patterns. Going forward he will be using this product for live trading and when creating his educational webinars and videos. ...the current version is faster, more efficient, and finds many more tradeable patterns than the prior versions were capable of. In addition to major updates to the pattern engine, we have added two new patterns (Gartley 886 and Deep Crab) as well as several new supporting indicators such as HSI Arrows, RSI Bamm, Amplified RSI, Pi Phi Bands, and Volume Spike. Our licensing options (see below) have been expanded as well, you can select the option that makes the most sense for you. We encourage you to browse through our updated User Guide so you can get a firsthand look at all of the new features and functionality. If you are not currently a eSignal user, you can sign up with a 25% discount here. eSignal is the most reliable charting platform available. All Patterns Only tier licenses receive a 30-day complimentary Harmonic Trader Gold Membership (as long as you remain a Patterns Only tier subscriber), which includes live harmonic trading sessions with Scott Carney, access to recordings of past trading sessions, access to the Harmonic Trading Video Library, the Harmonic Trader Monthly Report, and PDF downloads of "The Harmonic Trader". For eSignal add-on subscribers, you must be subscribed to all patterns to be eligible for this free Gold membership. The installer will install the entire Harmonic Pattern Collection package, and your license selection will determine which indicators you have access to. If you are an existing Harmonic Pattern Collection user, please follow the instructions in the Quick Start section of the User Guide to upgrade to the current version. If you previously trialed one of the earlier versions and are interested in having a 7-day trial of the new version, just send an email to support@sr-analyst.com and include your eSignal username and we will get you set up. If you are new to the Harmonic Pattern Collection you can either sign up directly through eSignal Account Maintenance for the monthly subscription (first month is free) to the Patterns Only tier (Tier 2), or review the tiers above and purchase a subscription directly from us at a large discount over the monthly Add-On cost. If you are new to the eSignal platform, please be sure to check out our eSignal Subscription Discount page where you can get a nearly 25% discount (in perpetuity) over the standard eSignal subscription rates. This is a great offer and is only available through our site! Note: The installer has been tested on Windows 7, 8, and 10 and should work with both Administrator and standard privileges. If you do have any issues please let us know immediately. The installer will replace the existing HPC files in your eSignal Add-on folder with the new version. Please see the Installer topic in the user guide for more information.